Galen Wickersham grew up in Magnum, Oklahoma but moved to Washington, DC in 1941 when his father was elected to the U.S. Congress. As a teenager, Galen enjoyed building model planes, trains and military vehicles. So, when he learned about the Fisher Body Craftsman’s Guild competition, creating a model car came naturally. He won awards for four years straight beginning in 1948 and began attending the General Motors Institute after graduating from Anacostia High School in 1952. 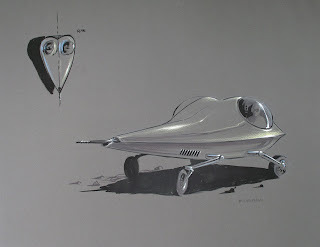 Oldsmobile concept in Wickersham's Senior Portfolio at Art Center. Wickersham quickly learned engineering did not suit his interests or skills and returned home to Washington only to be drafted into the Army. After two years of service Galen returned to DC and attended George Washington University for three semesters. Then the industrial design program at Art Center College in Los Angeles caught his attention. Galen applied for admission with a few drawings and illustrations he had - along with one of his FBCG models. Another concept in Galen's Art Center Senior Portfolio. When Galen was accepted, he quickly sold his new Thunderbird and bought a station wagon to move his young family out to California. 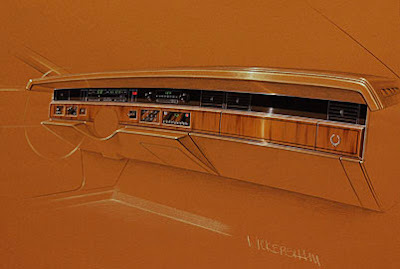 Some of his classmates at Art Center were Syd Mead, Jerry Brockstein, Roger Hughet, Don Wood and Diran Yazejian. 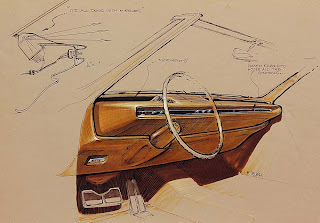 After graduating in 1959, Wickersham interviewed with Ford, General Motors and Chrysler and was offered an interior design job at GM and a position in exterior design at Chrysler. 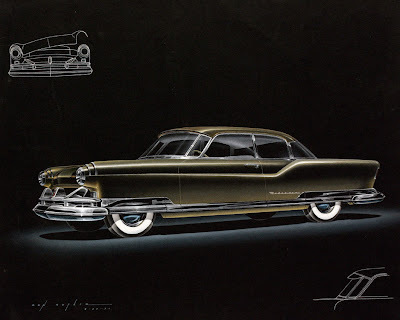 Because of his earlier experiences with the Fisher Body Craftsman’s Guild, Galen accepted the GM offer and began work in the Pontiac Interior Studio. 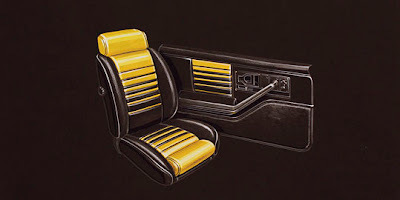 Cadillac instrument panel - Prismacolor on Canson paper. 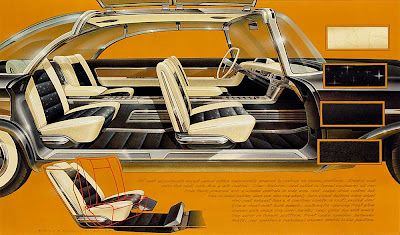 Over the course of his 41 year career at General Motors, Galen worked on numerous Pontiac, Chevrolet, Cadillac and truck interiors. He also did work on truck exteriors in the late 1990’s before retiring in 2000. Galen is an avid collector of toys, designer lamps, primitive and contemporary paintings, prints and ceramics. 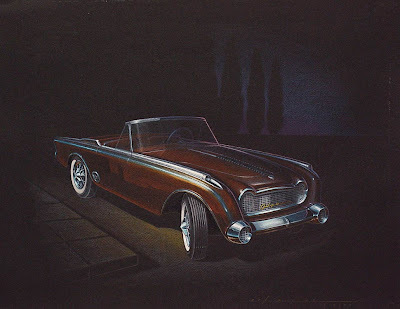 Growing up around California's Monterey Peninsula, Ben was influenced by the many local artists that found work as school teachers as well as west coast 1950's hot rod culture. He graduated from Pacific Grove High in 1957 and attended the Art Institute of Chicago, majoring in sculpture and fine art. 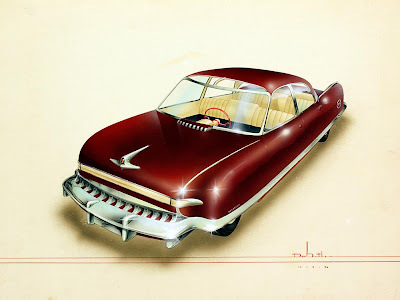 But after two years, his love for hot rodding and automobiles resulted in a transfer to the transportation design program at Art Center College in Los Angeles. One of Delphia's imaginative sketches done "for fun on a slow day." When Ben graduated in 1962, it was a down year for the auto industry. Only two Art Center seniors had commitments from Ford and GM. Everyone else, including Ben, had to fend for themselves. Fortunately for the new husband and father, he was able to secure two interviews at Chrysler and another at Ford in Detroit. Delphia's sketches often included descriptive text to explain his innovative ideas. Delphia's first meeting was with interior manager Charlie Mitchell at Chrysler. Mitchell was impressed enough to hire Ben immediately. “But I still have other interviews today” Ben explained. “What for? You've got the job.” replied Mitchell who had already notified the other Chrysler manager that the new guy wanted a job in interiors. Ben never made it to the Ford interview. Here you can see Delphia's fine arts talent with a hand reaching for the shifter. 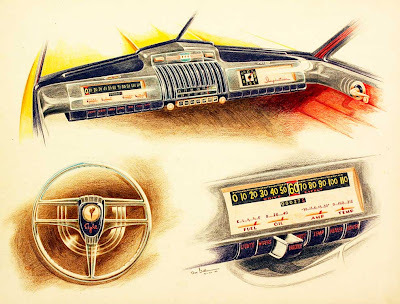 accompany magizine artices about Chrysler designs. Ben’s career at Chrysler spanned over 20 years. 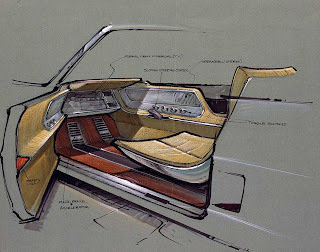 He influenced the interiors of concept vehicles like the 1966 300X and Chrysler’s production cars and minivans around the globe. 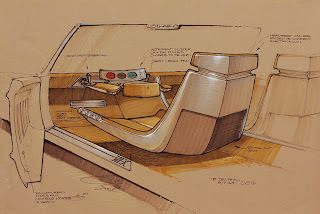 With permission from Design VP Elwood Engel, Ben also designed the “Reactor” for legendary customizer Gene Winfield. Besides being a hit at custom car shows, the vehicle was featured in episodes of Bewitched, Star Trek and Batman as Catwoman’s Kitty Car. Another one of Ben's 300X ideas for eliminating the steering wheel. 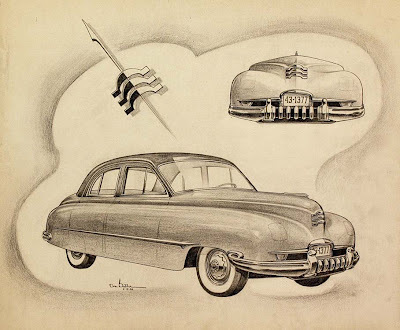 As many car companies began to outsource their interior design and manufacturing, Delphia saw the opportunity to leave Chrysler and develop his own independent design firm. 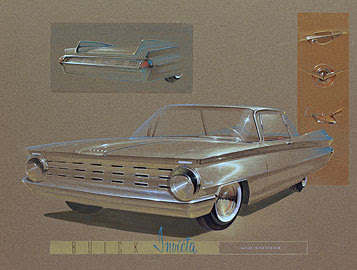 Years later he accepted the position of director of styling, design and graphics for Magna Interior Systems. 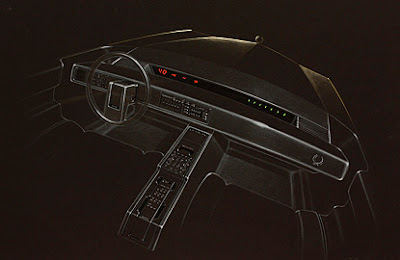 This instrument panel sketch proposed using mirrors to give the dash a sleeker look. 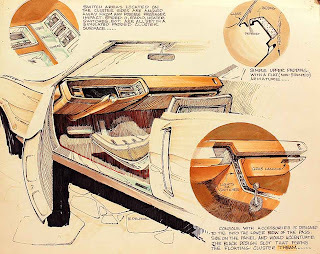 He is a recipient of the Automotive Interiors Lifetime Achievement Award and has taught transportation interior design at Kendall College of Art and Design. 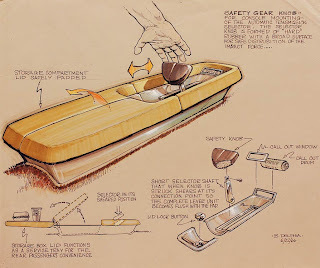 Delphia holds 18 patents and over 30 corporate co-patents. You can see more of Ben Delphia's sketches in my gallery.